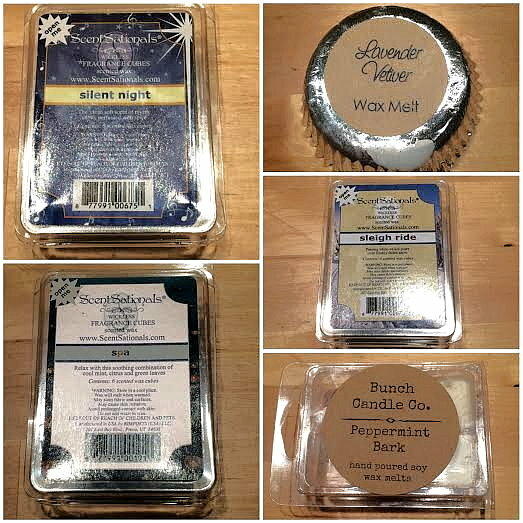 * I received the Bunch Candle Co. wax melt in exchange for my honest review. The rest of the wax shown here was purchased by me. It's been fun week of new to me wax! ScentSationals had a Black Friday/Cyber Monday sale, so I stocked up on wax from them that I couldn't find in store. I think I found my all time favorite wax too! I also got to review a wax from a new candle/wax company, Bunch Candle Co.
Scent Description: The clean soft scent of myrrh subtly perfumed with spice. My Thoughts: To me, it smells like a soft men's cologne type scent. I'm not sure how else to describe it. It's not overpowering or intense like some men's cologne scents can be. I wish I could be more descriptive, but it's basically a clean man scent without being harsh. I do really like it though as it is a nice variation from standard holiday scents. It still fits in with the holidays because of the richness of this type of scent. The throw is nice with this one and I got around 8-10 hours out of it. Scent Description: Calm your senses with this soothing combination of cool mint, tart citrus and fresh green leaves. My Thoughts: This. is. amazing. This smells like Badger Balm's Stress Soother to me if you're familiar with that. This the absolute perfect stress and headache relieving scent. I get whiffs of rosemary, lemongrass, mint, lavender, and hint of citrus. This is the holy grail of stuff when it comes to aromatherapy for stress, anxiety, and headaches. It does not smell medicinal, but herbal and very soothing. This is a new favorite wax for me, and I went back on ScentSationals site and ordered 4 more packs. I don't want to be without this one! This has a nice throw and I got around 15 hours of scent out of it. My Thoughts: This is so hard to describe. This smells like bubble bath to me. I know that's not very descriptive. There is lavender, a strong green/grassy note and some soapy elements to it. That green/grass note in it is the strongest, and while I like it, it does wear on me after some time. I don't dislike it, but it's one that has a time limit for me. This had a very strong throw that lasted over 12 hours. Scent Description: Passing white veiled pines, over fresh fallen snow. My Thoughts: This was reminiscent of the nauseating Better Homes and Gardens Twinkling Holiday Lights. This had a lighter touch so I didn't find it as off putting. I tried so hard to like this, but I just don't care for it. This one has a strong earthy pine note paired with a strong mint note. Honestly, this smells like dentist office. Do you like this dentist? Me neither. Exactly, my point. This had a medium throw, but I didn't melt it very long because it smells like the dentist! Scent Description: the irresistible aroma of dark chocolate with mint essential oil to create a "true to life" scent of this much-loved winter candy. My Thoughts: This scent is spot on with the description. The crispness of the peppermint really pairs nicely with the chocolate. This reminds me a lot of Andes mints, which I love. This isn't artificial or overly sugary smelling at all. It's pleasant, crisp, natural, and yummy. This had a strong throw, and I got around 8-9 hours of scent out of it. The ScentSationals waxes I melted today can be found on their site for $2.99 each. Ten Digits Wax can be found on their site for $1.50 each. Bunch Candle Co. wax can be found on their site for $4.00 each.